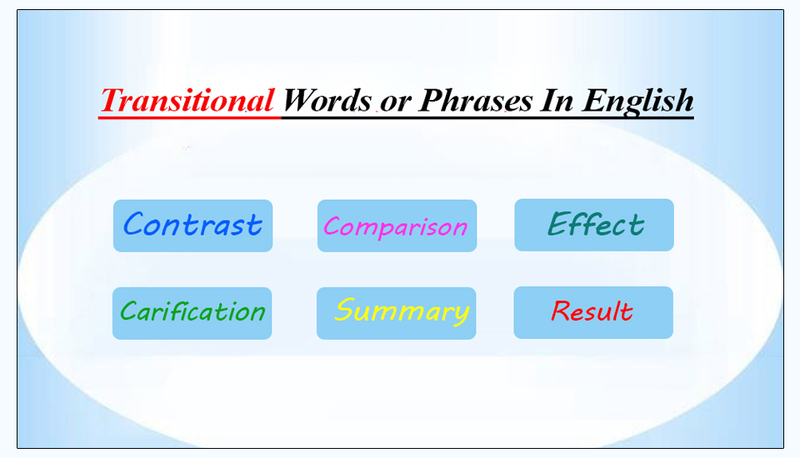 The transition words or phrases connect ideas and also introduce contrast, comparison, effect, clarification, summary, illustrations, agreement, purpose, result, conclusion, etc. Below is a list of commonly used transitional words or phrases in English which can be used by students or teachers to find the right expressions. He is not only a nice guy, but also a nice computer operator. Following Transition words are used to show agreement, similarity and addition. As well as He performs as well as the students. Too He has a perfect job, too. As a matter of fact He is not a student. As a matter of fact, he does not like studying. Then You have to study, then you will be able to compete. These transition words are used to show contrast, opposition and limitation. Of course….but Of course, you are right, but I can’t do it. Otherwise They should play well otherwise they’ll lose. On the other hand He loves to work; on the other hand the doctor has restricted him from working. Besides They can take time besides they have to make count of the time they take. The following transition words or phrases in English present specific conditions, intentions and purpose. In order to He talks in order to improve his speaking. So that He tries hard so that he is successful. In the event that He seemed so good in the event that he made his century. With this intention I will get the position; with this intention, he is going to challenge his rivals. The following transition words are used to give examples, support or to emphasis on the idea. He lies a lot. In fact he is a liar. Note: for and because are used before the cause or reason. The others are used before consequence/result. For He works hard for promotion. Because He likes black because it is professional. Thus He could not beat his brother thus he is out of the game. In that case He committed crime; in that case he was arrested by the police. Ultimately After a lot of hard work, ultimately, he got the deserved position. In either case You do it or not, in either case you will be in loss. To sum up Hadia washed the dishes, Asghar collected the plates, Mehrin arranged the hall, to sum up they all did their hard work. Overall Their overall performances were good in all the matches of tournament. The following Transition words are used to talk about time, sequence and chronology. Sooner or later Sooner or later, you have to perform. As long as There is a hope as long as he plays for us. As Soon as He killed him as soon as he got Khaliq killed his cousin. All of a sudden Everything was going well, all of a sudden something exploded. These Transition words are used to mention place and locations. In the middle He interrupted in the middle of class. Between The village is in between the two mountains. Next He sits next to his sister. Across He came across the road after a lot of difficulties.